This is the treaded layer on the under surface of the shoe usually made from carbon rubber or similar material. It resists wear and provides traction. It may also have a studded or waffle design to enhance traction on softer surfaces. This is considered the most important part of running shoes as it is the cushioning and stability layer between the upper and the outersole. The most common materials for the midsole of running shoes is ethylene vinyl acetate (EVA), polyurethane (PU) or a combination of the two. Often there is a dual-density midsole that has a firmer material on the inner side (medial side) to help limit pronation (rolling in) of the foot. This is the part of the shoe that wraps around and over the top of the foot. It may be made of leather or a synthetic material that is lighter and breathable to reduce heat from inside the running shoe. The tongue of the upper should be padded to cushion the top of the foot against the pressure from the laces. Often, at the back of the running shoe the upper is padded to prevent rubbing and irritation against the Achilles tendon. This is a firm and inflexible cup which is built into the upper of running shoes and surrounds the heel. It is usually very firm so that it can control motion of the rearfoot, if the heel counter is either too hard or too soft it will irritate your Achilles tendon. This is the firm material in the midsole which increases stability along the inner side (arch side or medial side) of the running shoe. All runners need the best protection that running shoes can provide – the running shoe needs to be able to:- absorb shock, control motion, be flexible, durable. Because of the complexity of individual foot biomechanics and of running shoes on the market, it is usually a good idea to go to a specialty running shoe store as they will have the expertise to help you find the best running shoe for your individual needs. There is no best running shoe. Every runner is different and every brand of running shoe is different. 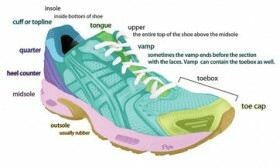 The challenge is to match the features of each runner to the features of a particular brand and model of running shoe. The first step is deciding the type of foot you have – it is probably the most important aspect of matching a brand and model of running shoe to the individual. During normal running (and walking), the outside of the heel strikes the ground first (supinated position) – this is why the wear is common in this area. The foot then rolls inward and flattens out along the longitudinal arch (pronation). The foot should then supinate by rolling through the ball – this helps make the foot a rigid lever for efficient propulsion. A number of different biomechanical problems can interfere with these normal motions. A running shoe can help facilitate this normal function and help overcome many of the minor biomechanical problems that interfere with these movements. Usually, most runners who develop an injury either supinate (roll out) or pronate (roll in) too much. Normal amounts of pronation and supination are needed for normal function, but abnormal amounts increase the risk for injury. 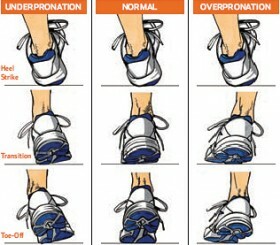 Excessive pronation is the most common cause of running injuries. A pronated foot rolls inwards at the ankle, the midfoot bulges inwards and the longitudinal arch flattens. Those who over-pronate generally have very flexible and unstable feet, so need running shoes with motion control. A motion control shoe has design features that give a high level of support – a firmer anti-pronation post on the inside of the midsole, a firm or dual density midsole and a firm heel counter. A supinated foot rolls outwards at the ankle and has a high arch. They tend to be more rigid and are very poor at absorbing shock, so they will need running shoes with more cushioning. Cushioned shoes tend to be poor at motion control. The amount of excessive pronation or supination present will determine if you need a neutral running shoe. Once the type of running shoe is matched to your foot type, several brands and models should be tried for comfort and fit. Check for adequate length by determining if there is a full thumb width between thE end of the longest toe and the end of the shoe. The toe box should allow the toes to move around. The shoe should have adequate length at the widest part of the foot – it should not be too tight, but the foot should not slide around either. If in doubt, err on the larger size. 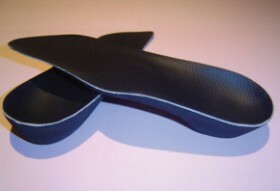 The heel counter should fit snugly – the heel should not slip and rub. Go for a run in them – How do they feel ? Try several brands and models in the type of running shoe that you need – they will all have different fit and comfort characteristics. Ensure BOTH feet are measured correctly. Make sure the running shoe sole flexes easily where the foot flexes. If you have Orthotics, fit the shoes with them in. 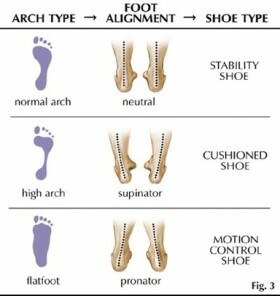 Also, buy shoes with insoles that can be removed so you can modify or replace them with Orthotics. Do not rely on a break in period – running shoes should feel good the day you buy them. How long do running shoes last? This is dependant on how much time is spent in the running shoes. The midsole, which is the important cushioning and stability layer of running shoes, usually wears out before the outsole. When this happens the running shoe looses its functional stability. The best way to check for this is to look for creasing of the midsole material in areas of high load. Also monitor the torsional (twisting) stability of the shoe. As a general rule, you should be able to get up to 1000km from a running shoe. Ensure there is good flexibility over the toe box. Ensure that there is good flexibility in the midsole. Ensure you have a neutral shoe. Remove any insole that the shoe came with. Ensure the width of the inside of the shoe is an exact match of the width of your Orthotic, measuring from the middle of the arch across the inside of the shoe. Your Orthotics are made from a cast of your feet which exactly represents the true width of your foot. Your Orthotics must sit perfectly flat inside your shoes.